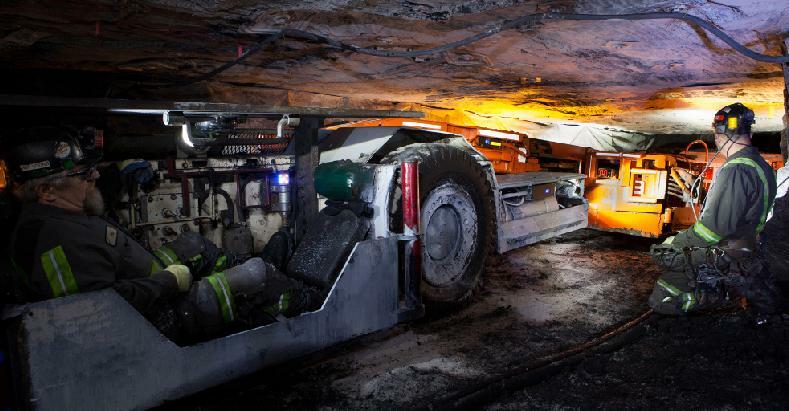 Strata’s proximity detection and collision avoidance technology has been developed in partnership with the US Mine Safety and Health Administration (MSHA) to reduce crushing and pinning accidents and collisions between machinery. HazardAvert® is an electromagnetic proximity detection (PD) and collision avoidance (CA) system for surface and underground mining and construction environments. It is designed to increase worker safety awareness and prevent equipment-to-people, equipment-to-equipment, and equipment-to-stationary objects collisions. HazardAvert generators installed on equipment create electromagnetic marker zones. Zones are designated as ‘warning’ and ‘hazard’, depending on distance from the equipment. Workers wear a personal-alarm device (PAD) that detects these marker zones and calculates proximity to the equipment. Pedestrians are warned by LED lights and high-pitched buzzer alarms on their PAD, and equipment operators are warned by an On-Dash Display Screen that provides visual representation of the zone breached, along with an audible alarm. With the inclusion of wide-angle cameras on the front and rear bumpers of the equipment, operators have live video feed on the on-dash display screen as well. HazardAvert electromagnetic zones are fully functional both on the surface and underground, ensuring that vehicles traveling between surface and underground locations are continuously armed and detectable. Studies show that a large majority of accidents and injuries occur when machinery and vehicles are traveling at lower rates of speed and in reverse due to close proximity. HazardAvert can be programmed to stop or disable equipment at specified speeds determined by the original equipment manufacturer (OEM) and customer. A range of data is recorded by HazardAvert during operations and is available for reporting. This can be retrieved via Wi-Fi or cable, or wirelessly transmitted over StrataConnect™ wireless networks. Strata HazardAvert 360°™ is a surface proximity detection and collision avoidance system that seamlessly combines multi-range detection technologies, to provide close range, extended range and full-view awareness while working in and around heavy and/or highly mobile equipment. It is designed to detect pedestrians and other mobile equipment in the vicinity, display their location on an on-dash display screen, and emit warning alarms if there is a potential danger of collision. HazardAvert 360° can be used on any type of mobile equipment for vehicle-to-vehicle detection. The system determines the relative location of vehicles and represents their position and movement on the on-dash display. If the system detects a potential collision, it will audibly and visually alarm and simultaneously alert all vehicle operators involved. For vehicle-to-person detection, pedestrians wearing a PAD will appear on the on-dash display and be identified as a pedestrian. If danger is imminent, both the pedestrian and equipment operator will be immediately alerted. HazardAvert 360° and HazardAvert can be integrated to operate in conjunction and display information on a single user interface. Together the systems provide comprehensive detection and alarm capabilities, including the ability to automatically slow, stop or disable the equipment in an emergency situation. The system integration is seamless, requiring no interaction or input from equipment operators during operations. Strata Worldwide, a global leader in mine safety innovation, has been working internationally and locally to improve safety in the mining industry through advanced technologies, including proximity detection systems. Strata Worldwide has extensive R&D and real-life experience with collision avoidance and proximity detection technologies. Leveraging the utility and flexibility of the Strata/Trolex Sentro Wireless, surface operators can wirelessly monitor underground working environments, and control electronic devices during operations. Proximity Detection and Collision Avoidance solutions for surface, underground and surface-to-underground working environments. Increasing worker safety around heavy machinery. Robust, durable design for underground coal mining. Versatile network for underground connectivity. Strata Worldwide has years of R&D and real-life experience with proximity detection and collision avoidance technologies. Strata Mine Services, a division of Strata Products Worldwide, has completed an asset acquisition agreement with Precision Mine Repair (PMR) of Ridgway, Illinois. Strata Worldwide is pleased to announce the US Mine Safety and Health Administration (MSHA) Intrinsically Safe (IS) approval of the Trolex TX6355 Sentro. Strata Proximity Systems has released two white papers about the HazardAvert proximity detection system.